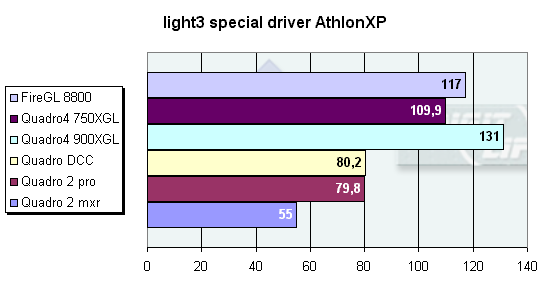 Let me remind you how we carry out the test. We load a scene and change no parameters except the drivers; also we activate animation. 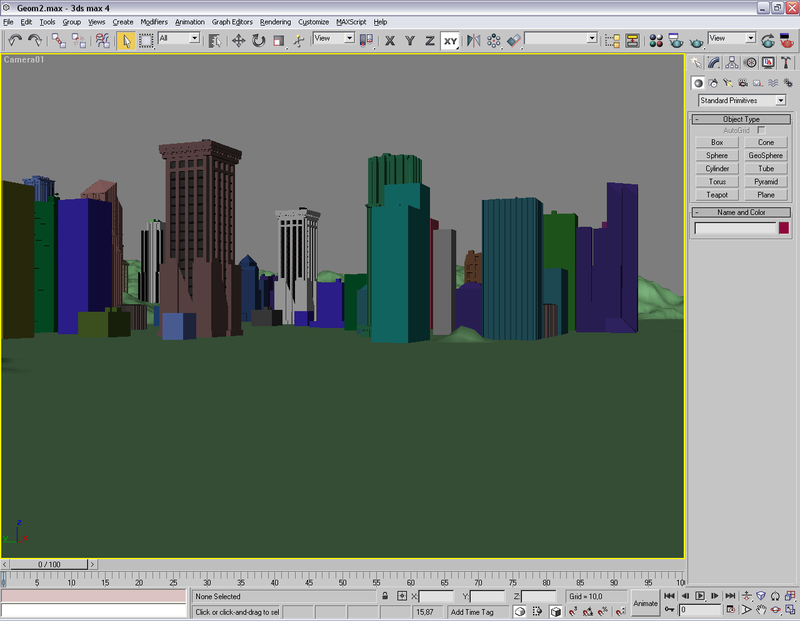 After a scene is animated 10 times we read fps in the middle of animation of the scene. 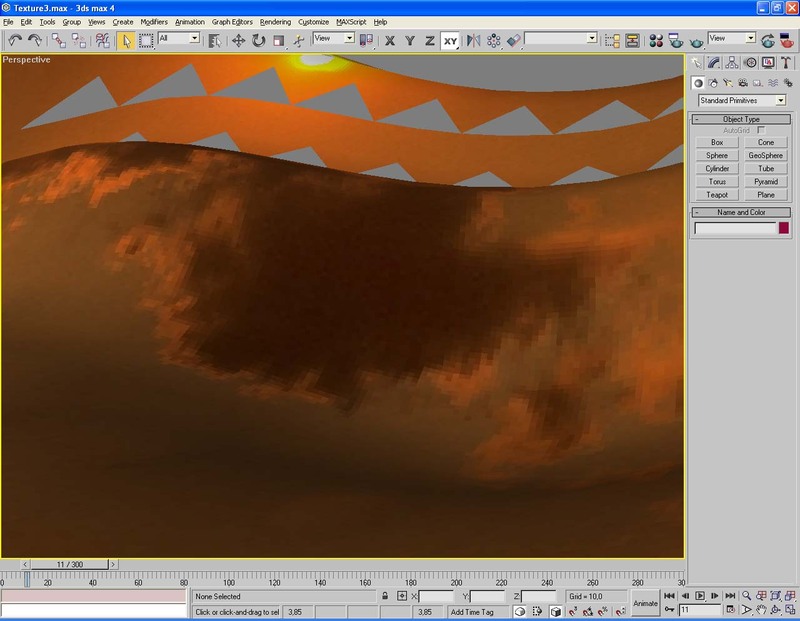 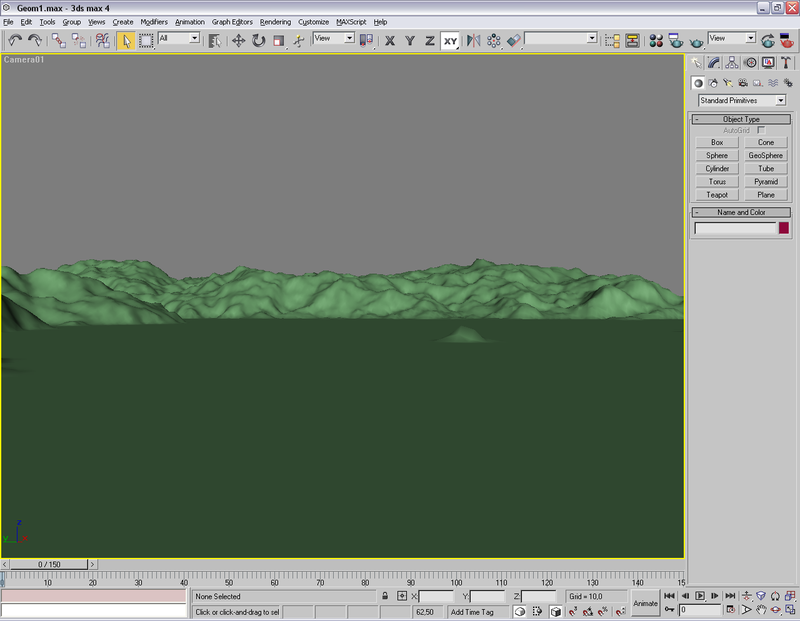 Then we implement the RESET instruction in the 3ds MAX and reload a new scene. 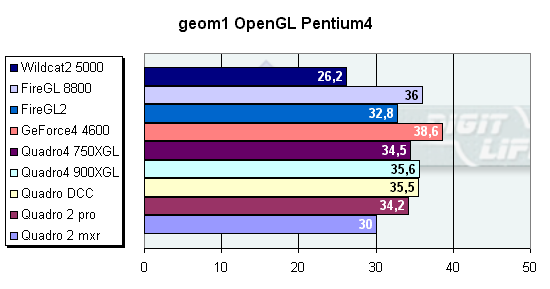 The diagram has the following signs: "OGL" is OpenGL API, "special driver" is either MAXTreme driver for the Quadro line, or MAXIMUM driver for the FireGL 8800. 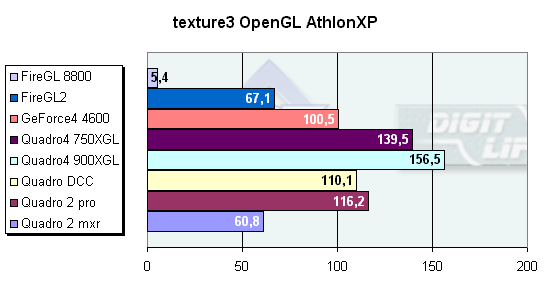 The test results for the AMD's platform do not contain the 3DLabs Wildcat II 5000 card because it is so big that it doesn't fit out stand. 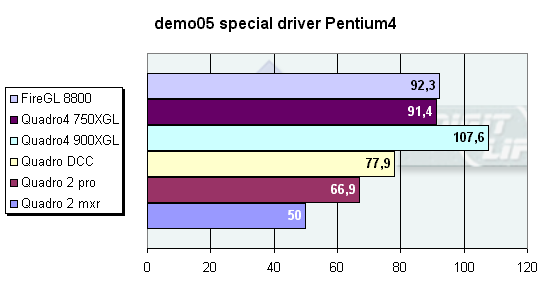 The tests were started with the demo04 and demo05. 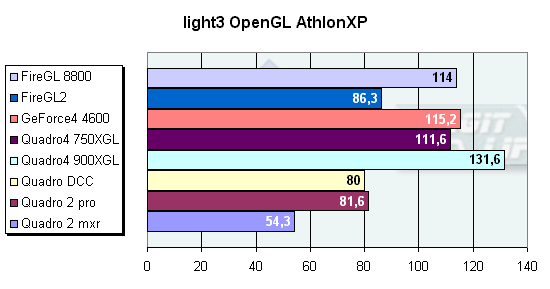 The FireGL 8800 works better with the special driver, while the Quadro line prefers the OpenGL. 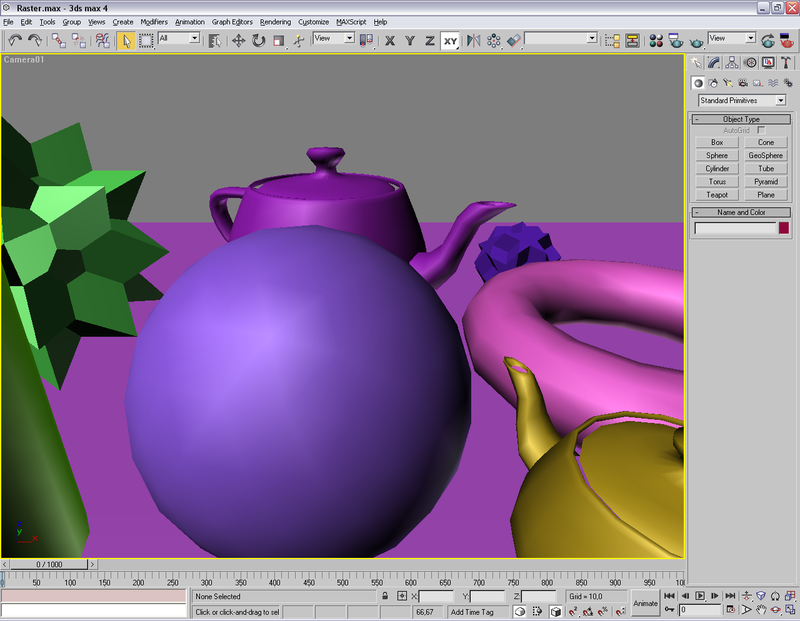 This scene tests simultaneous animation in all 4 viewport windows. 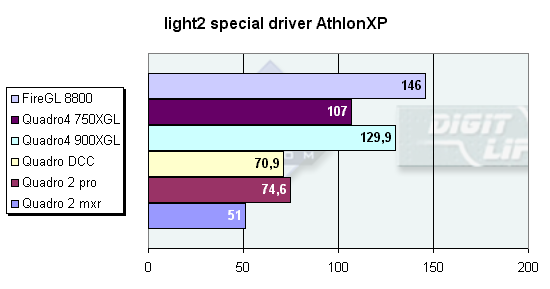 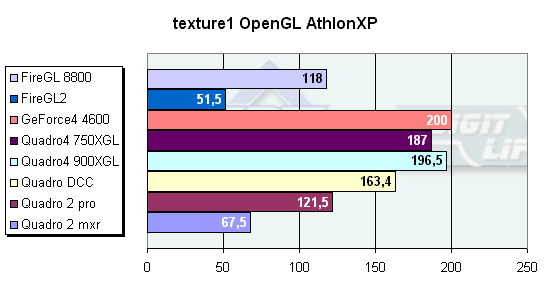 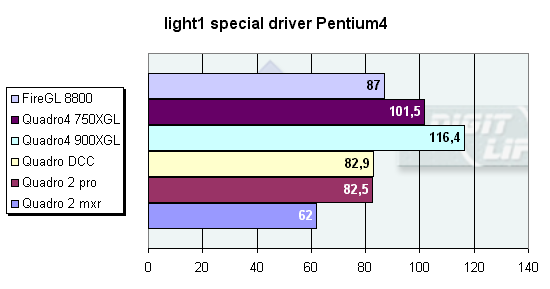 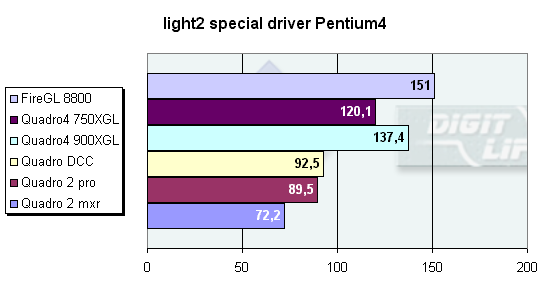 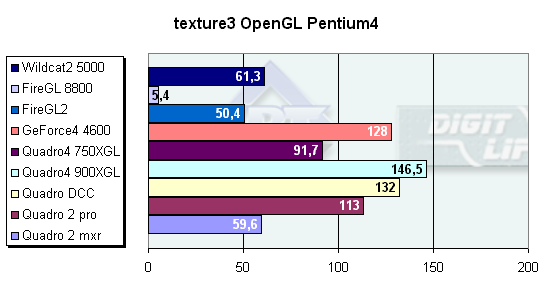 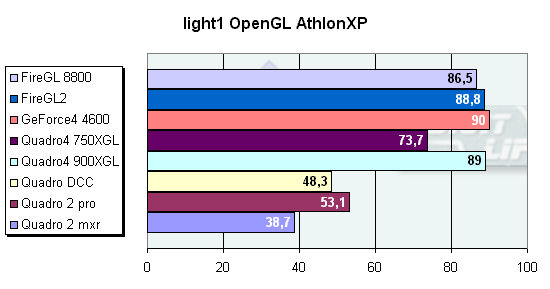 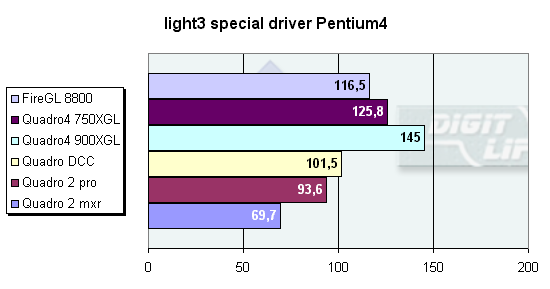 The FireGL 8800 is the slowest in the OpenGL, however the special driver helps it much. 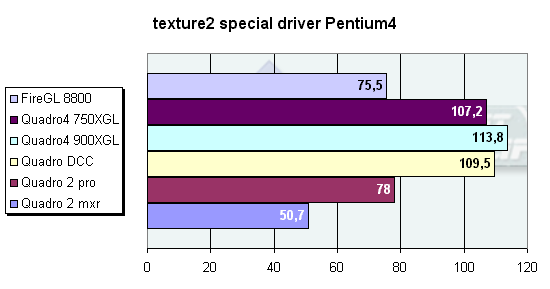 The rest perform equally in both cases. 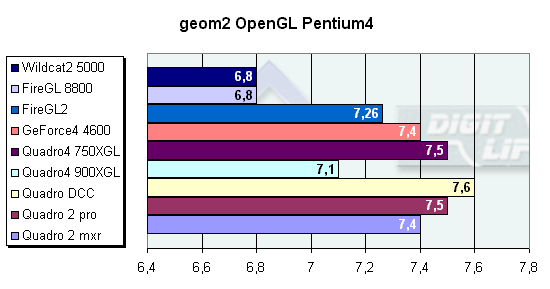 This scene tests operation of the card with geometry. 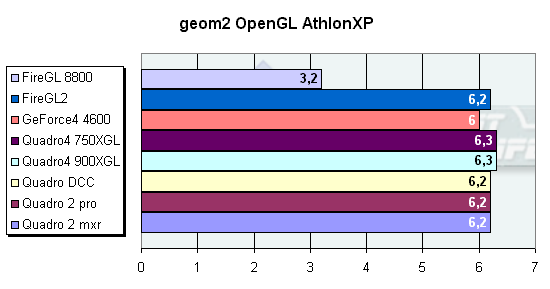 A combination of simplicity of polygons and their number makes a very powerful test. 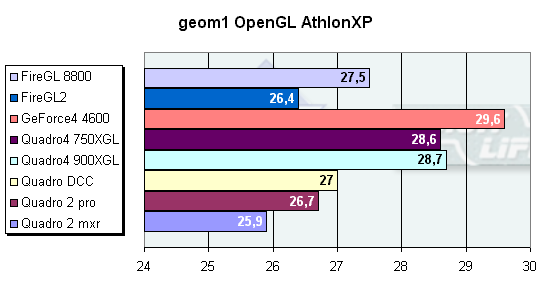 It's interesting that the game card turned out to be fastest in the OpenGL, while the WildCat came running last. This scene also tests operation of the card with geometry, but it has much more objects. 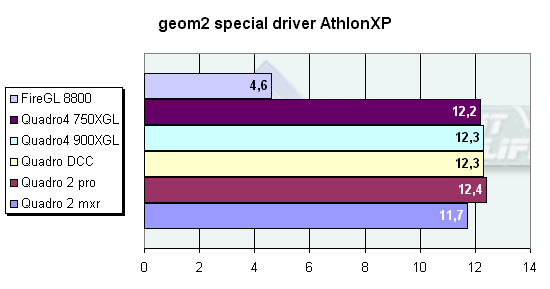 Well, such a complicated test reduced all to the same level. 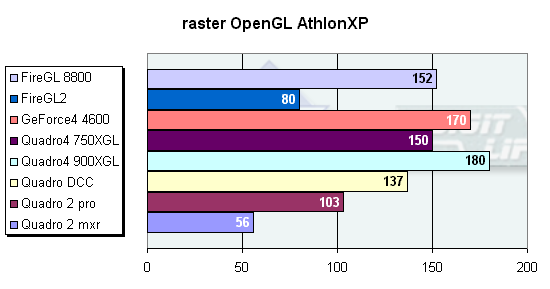 The difference is unnoticeable. 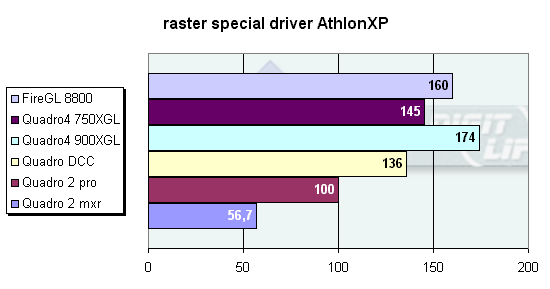 The FireGL 8800 and Wildcat fell behind by a great margin, and even the special driver didn't help the ATI's card. 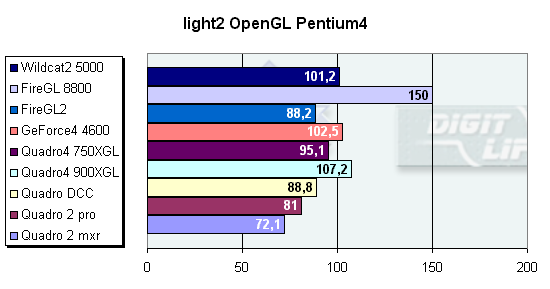 The scene tests how video cards work with light sources. Spotlight sources are the most difficult for rendering. 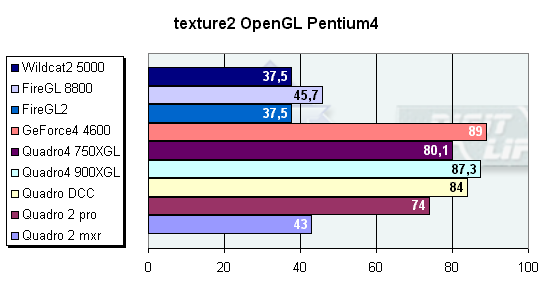 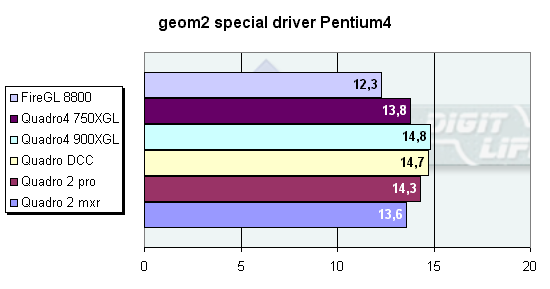 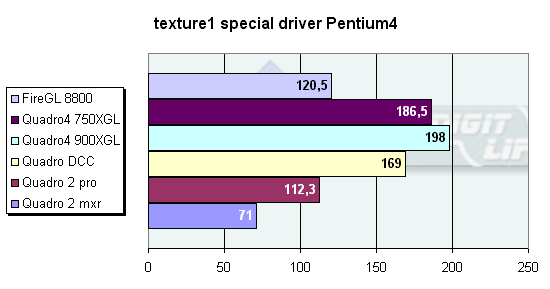 This test clearly shows the difference between the platforms and between the special driver and the OpenGL. 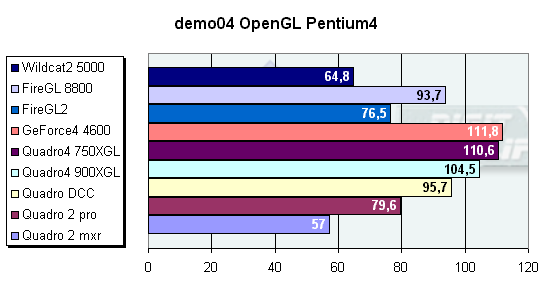 As for the cards, they compete in processor and memory frequency. 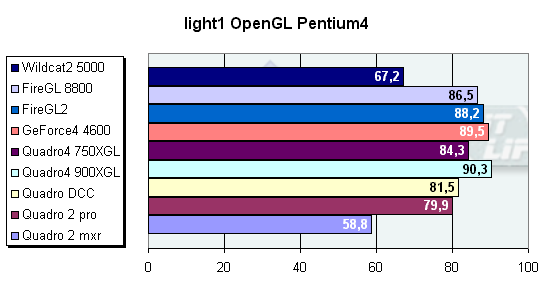 This scene tests operation of video cards with light sources. 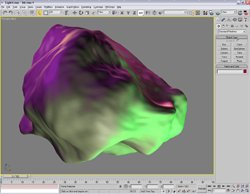 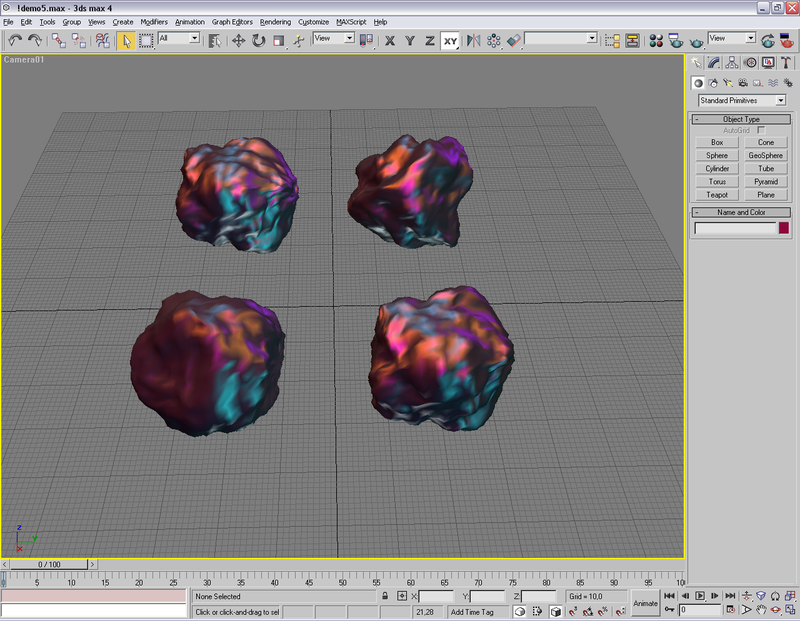 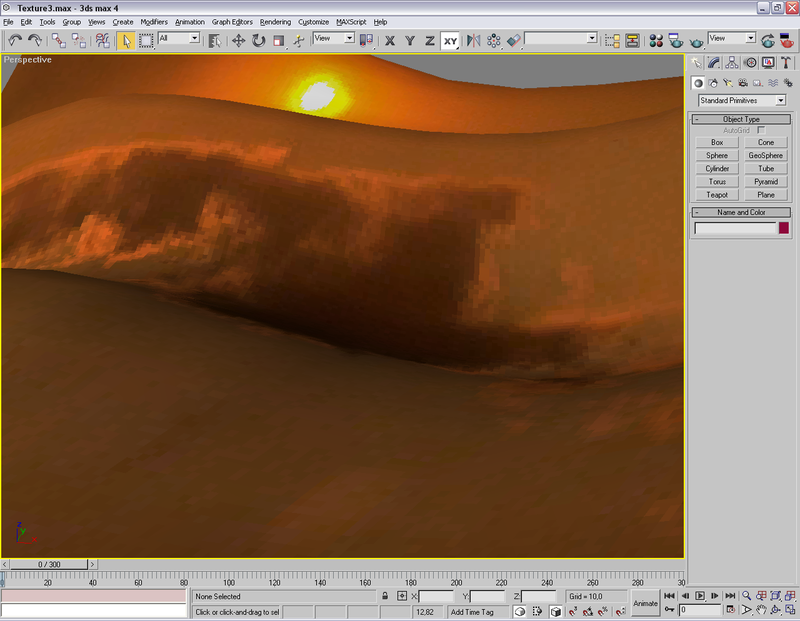 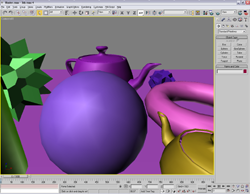 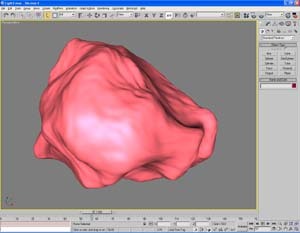 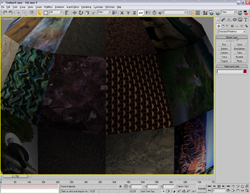 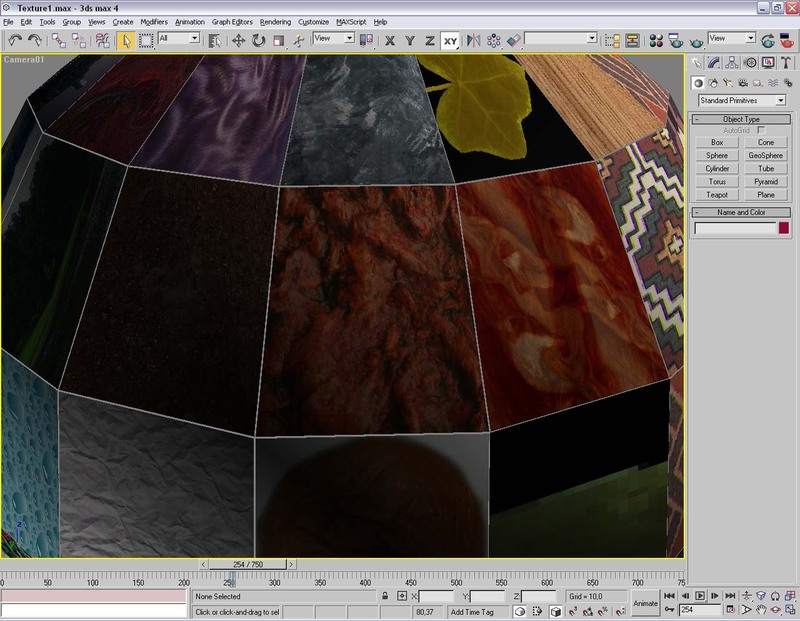 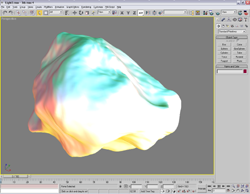 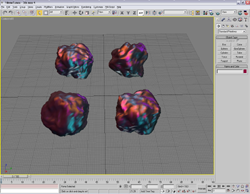 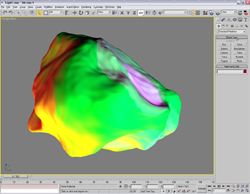 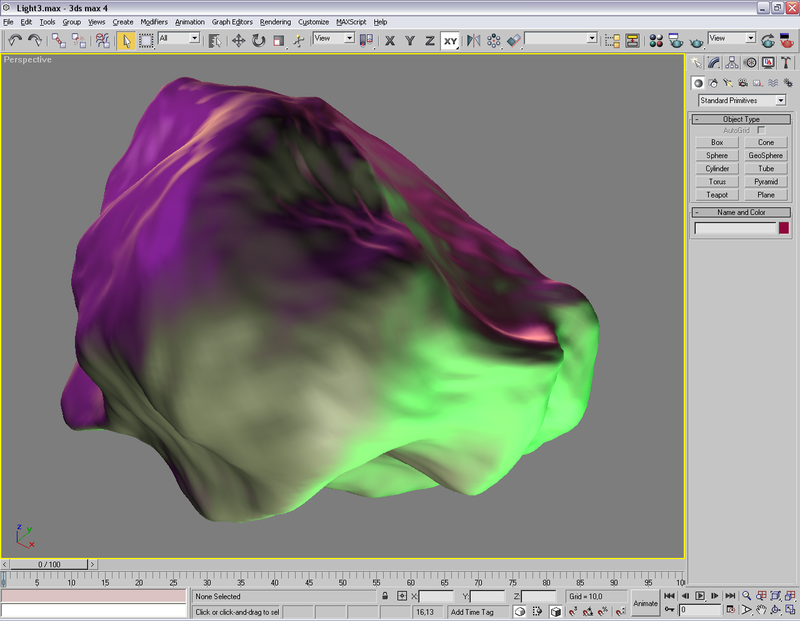 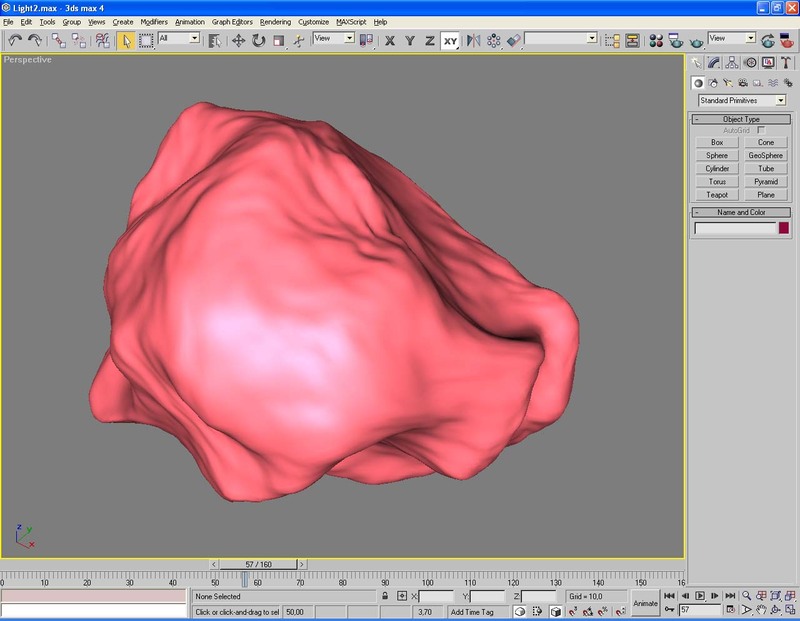 Direct and directional sources are average in complexity for rendering in viewport windows. 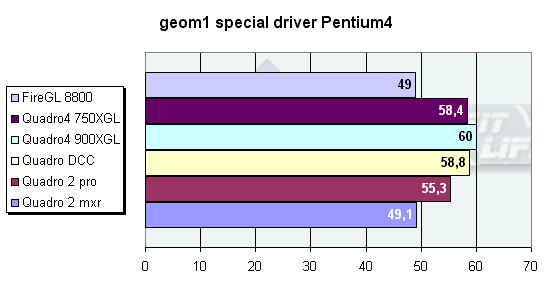 Well, again we can see that it is frequencies which compete. 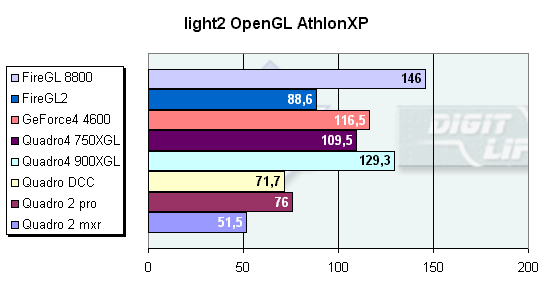 Such a brilliant breakaway of the FireGL 8800 must have been contradictory, but exactly in this scene operation of the FireGL 8800 is incorrect. 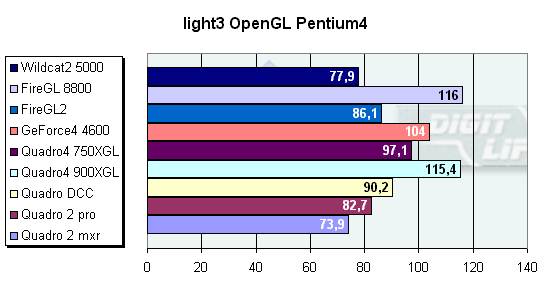 The lighting is incorrect. 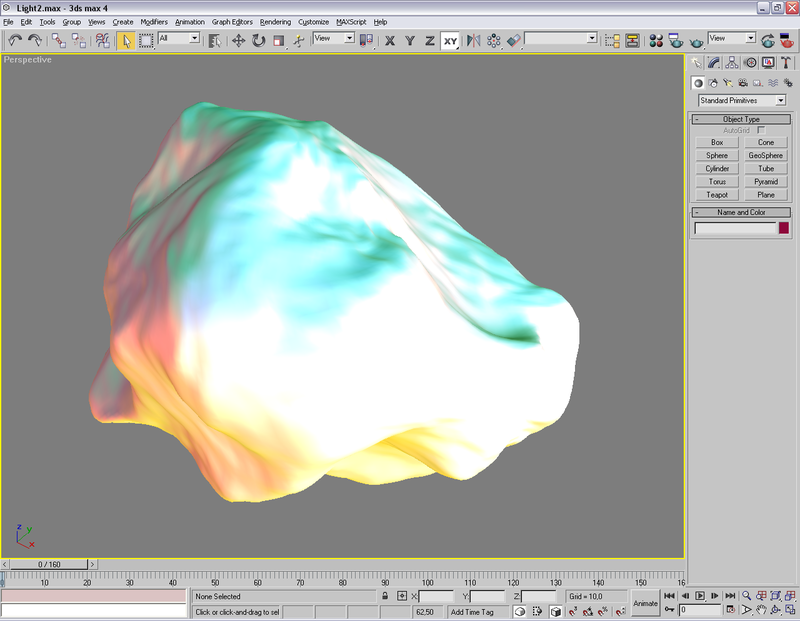 This object blinks with all colors, making fps too high. 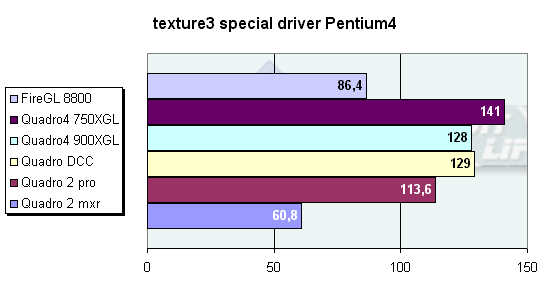 I don't know whether the drivers are buggy or the card is low-quality, but in the OpenGL and in the special driver the situation is the same. 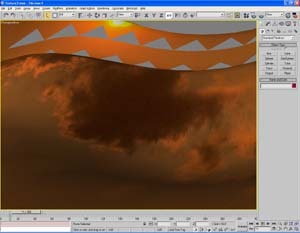 This is the last test of operation with light sources. OMNI sources are the fastest for rendering. 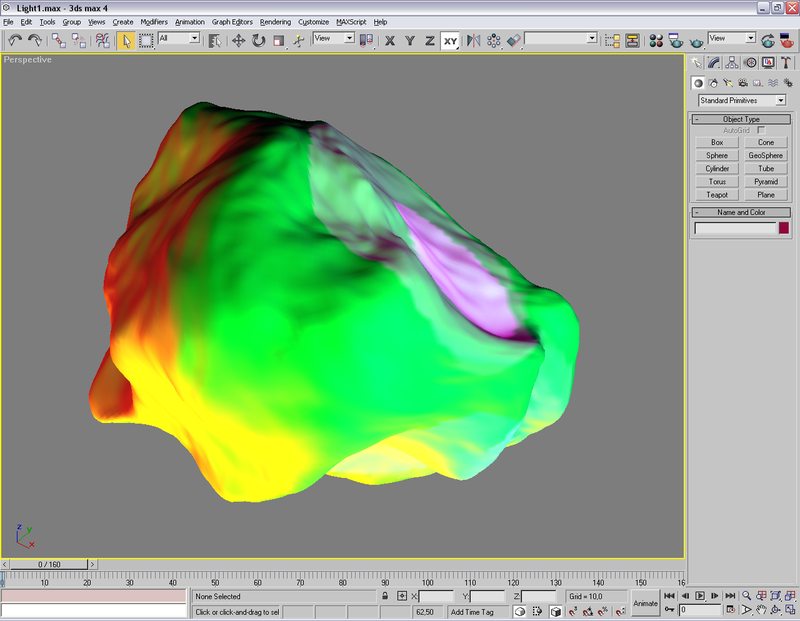 No more competition in frequencies. 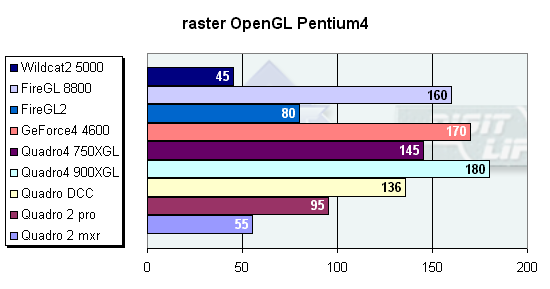 This scene demonstrates how cards work with rasterization. 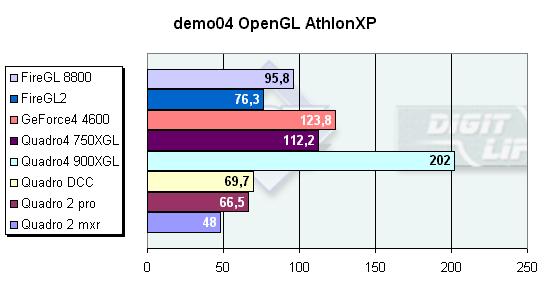 The Quadro4 900XGL is an unquestioned leader. 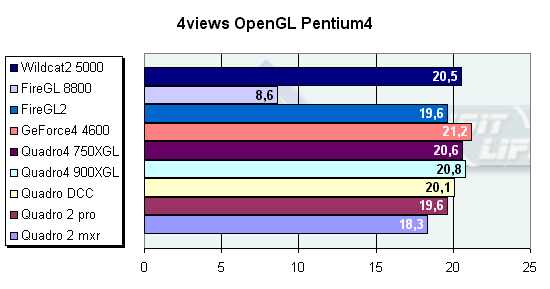 It has stable results on all platforms and under different APIs. 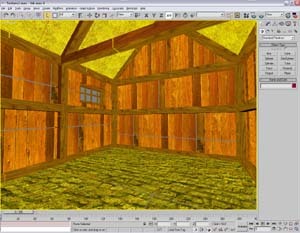 This scene shows how cards work with texturing. As you can see, the distance between the textures is too big. This scene shows how cards work with texturing and geometry. 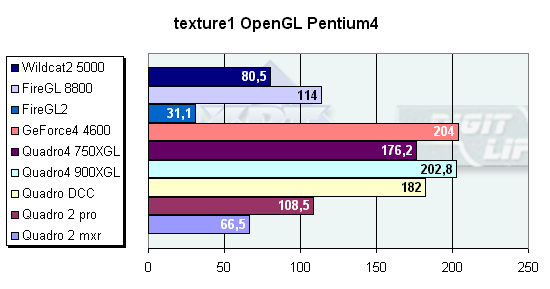 The scene shows how cards deform geometry with overlaid textures. It's seems to me that the card has buggy drivers. 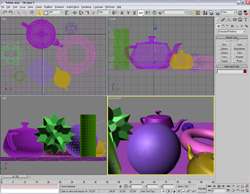 The last new scene wireframe will be examined in the next part: we will see how the cards work with the scene and with AA enabled.